Ritorna fiero nel pret à porter come bandiera di sincerità, una carta bianca tutta da reinventare con giochi di asimmetrie e lunghezze. Si staglia sulle fatidiche "overlaps" e proprio qui entra in campo la vena creativa di chi lo indossa, possiamo dunque scegliere una sovrapposizione di tonalità diverse, piccole stampe come motivo di rottura oppure dettagli neon e pastello su cerniere accessori, pochette. Prepotentemente neutro ed impeccabile: così il total white è proposto dalle passerelle di Cèline e Chanel, irriverente e sfrangiato per David Koma, casual e oversize per Diane von Furstenberg, dall'allure principesca nella versione Elie Saab, geometrico e strutturato per Gabriele Colangelo, Gareth Pugh e Rick Owens. Presentato in mood bon ton o più sportly, la costante del "total" rimane certa e ci sorprenderemo della sua versatilità nelle occasioni più disparate. In questa selezione di street style ho inserito anche qualche scatto significativo dello shooting di Miroslava Duma fotografata da Tommy Ton. Fatemi sapere che ne pensate e come preferite indossarlo..
Back in the pret a porter as a proud flag of sincerity, a carte blanche to reinvent with games of asymmetries and lengths. It stands on the fateful "overlaps" and just here the creativity of the wearer takes over, so we can choose a superposition of different shades, small prints as a ground breaking or neon and pastel details on accessories like pochette's hinges. Overwhelmingly neutral and impeccable: so total white is proposed from the Chanel and Celine catwalks, irreverent and fringed by David Koma, casual and oversized for Diane von Furstenberg, with princely allure in Elie Saab version, geometric and structured for Gabriele Colangelo, Gareth Pugh and Rick Owens. Presented in sportly mood or bon ton one, the constant of "total" remains sure and we'll surprise us of its versatility in the most disparate circumstances. In this selection of street style I've included also some shots of the shooting of Miroslava Duma photographed by Tommy Ton. Let me know what you think and how you prefer to wear it .. I love the girl's style on the 5th photo the right one! Loving white right now, just bought a gorgeous white dress from Zara, it's on my blog today! The white is so chic in summer !!! So many beautiful photos, I love white on white! MI piace molto il bianco. Mi piace indossarlo con l'abbronzatura giusta! adoro il bianco tutto l'anno, anche se effettivamente lo indosso di più in estate. il bello di questo colore é che sia con look elegante che sportivo, é sempre meraviglioso e unico! i adore all the outfits.white is such a classy and elegant choice. Le foto che hai scelto sono stupende!!! White on white on white is becoming really big again. I've been seeing all over the place..
Il bianco è in assoluto il colore che ho più voglia di indossare in estate! non vedo l'ora di poterlo indossare in spiaggia! un bacio tes! Sono foto bellissime, fanno venire voglia d'estate! white shows the high-class style.. and I just love the simplicity of it! white is always such a beautiful color to wear, especially when your tan ha. We are coming to Italy in one week and just can't wait...if you have any fun places we MUST visit please do tell! hi AareAn! places u must visit in Italy depend on in which part of Italy u spend your days:)Milan Florence, Rome are so different but really beautiful! 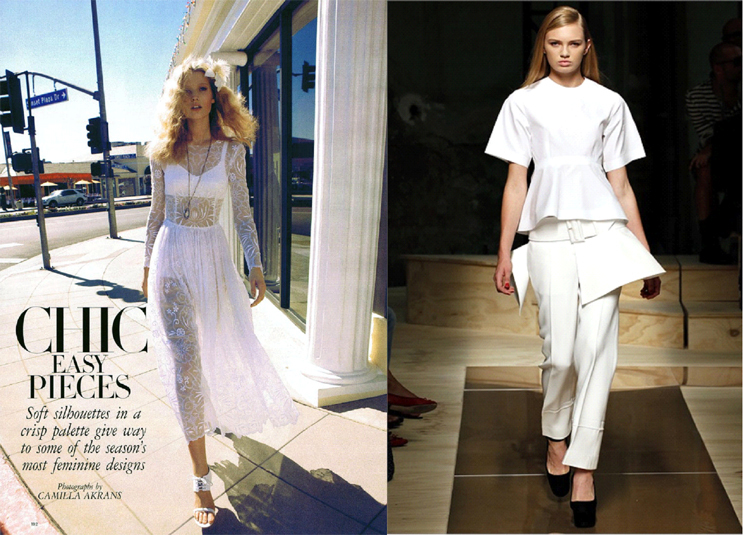 So much glorious inspiration here... all white is so classic and chic! i love all white looks. so chic! i so love it! really awesome! I love your post. 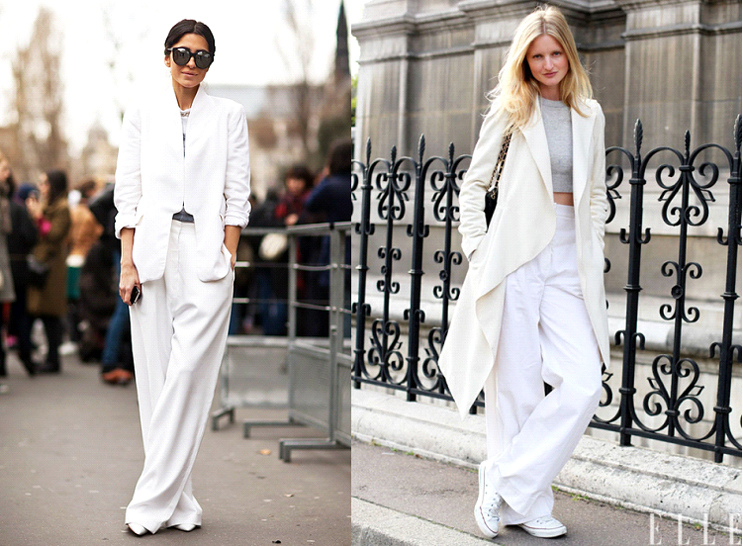 Total white is DIVINE! I love it as lace even as classic. I follow you for few days with enormous interest! White on white - can't wait to try something like that. Love the post and your blog :)!